Mageni’s daughter address’ her teacher in the ECD Centre close to their home. We believe that people and organisations have the best ideas and motivation to bring lasting change. Our work ensures young people’s hearts and heads are nurtured, so they are fully equipped to work to make the world a better place. There are three main reasons why our work is so important. Global inequality and poverty can impact negatively upon children. We work in partnership with people from Tanzania and Ethiopia to help improve the quality of life for young children. Changing children’s lives is the responsibility of us all, wherever we live. Development Education is an important part of our work in Ireland and the UK to introduce people to the structural causes of poverty, and help them find a role in making the world a better place. Children in Crossfire recognises that to reach our Vision and build a compassionate world for every child, change is required. 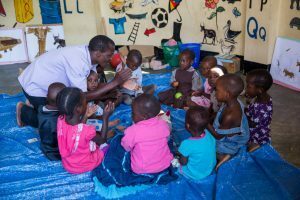 We focus on Early Childhood Development in Tanzania and Ethiopia, ensuring young children get to go to school feeling well prepared, happy and in good health. We Create Waves of Change in the Classroom in Ireland and the UK through giving teachers the tools, skills and confidence to develop young people as active and caring global citizens. We believe that the seed to build a compassionate world lies within in us all. Therefore, in all areas of our work, we seek to awaken, cultivate and nurture that seed for a better world. We believe that when everyone acts out of love and compassion for humanity, then Children will live in a world where global injustice no longer exists. 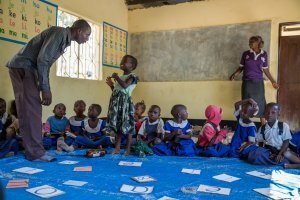 To ensure children get the best possible start in life so they can learn and develop at school we focus on three main themes in our work; education, health and nutrition. By focusing on school readiness means children enter school with the academic, social and physical skills needed to flourish as they grow up. 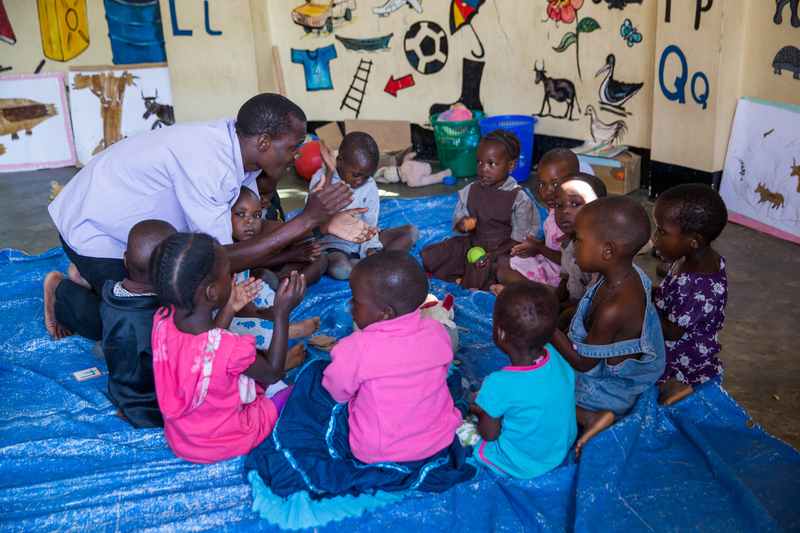 Accessing quality pre-school programmes is a key aspect. Evidence tells us that children who can access a quality pre-school programme perform better in school. Children in Crossfire focuses on supporting teachers to improve their proactivity in the classroom by providing plenty of mentoring support in addition to learning opportunities. They are provided with learning materials that support good teaching practice in creating a supportive, knowledgeable structure around them in their school and community. This encourages them in their work. A child that is ready for school is one that has had good nutrition from birth. Poor nutrition leads to delays in physical and cognitive development that has lifelong implications. Children in Crossfire work with vulnerable mothers to teach them about the importance of good feeding practice from birth. They are supported to understand basic principles of good nutrition, the foods in their local environment that can give their children the nourishment they need to grow and thrive, and the places they can access support services within their communities. Alongside this, we strengthen local community structures and nutrition officers to be able to provide better services to their communities. A child that is ready for school is a healthy child and this starts from birth. Illnesses in early childhood can negatively impact physical and cognitive development, but many of them are easily preventable. We support mothers in vulnerable families to be aware of key messages relating to child health – this ranges from actions to prevent malaria, good sanitation in and around the home and the importance of simple good hygiene like washing hands. Mothers are also made aware of basic symptoms for illnesses and the places they can go to access treatment. We also strengthen these health services to ensure the person they meet has the capacity to treat and advise parents and their children. In order to understand if our work is making a difference to the lives of the people we are trying to support, we need to measure our progress. We do this by agreeing a set of measures or indicators that we can track that will tell us if we are making a difference. A Baseline survey is the initial measure of our indicators that we do before our work starts. It is the starting point. We hope as we implement activities that the measures will improve, so we also monitor these measures throughout the programme and at the end. Being able to demonstrate ‘impact’ in this way helps us engage with government, our donors and most importantly show the people we are supporting that the activities are making a difference. Why do Children in Crossfire work in partnership? We believe that local people and local organisations are best placed to understand their challenges and to develop the solutions that will address them. We also believe that a vibrant, active civil society that represents the people are more effective in representing their communities in advocacy work with government and other authorities. For these reasons, we work with local organisations in our target areas to implement our programmes. We do not have the means or the ambition to run services directly in the communities where we work – nor should we. We want to support and strengthen the systems and organisations that are already there. We do this through ‘capacity building’. We train frontline professionals already within the services with skills to perform their roles better, we support systems that will monitor their performance and we encourage accountability to the communities where they work. Alongside this, we strengthen our local partners to have better governance, finance and management systems, technical skills and ambition to create lasting change. By doing this we create sustainable quality improvement that can be measured and used in our advocacy work. How does advocacy work help children? We work in target communities to directly support the most vulnerable children. However, we do not have the capacity or funding to do this for all children in the countries where we work. This is the role of government, who carry ultimate responsibility for its citizens. Therefore we work in line with existing government structures, laws and policies and alongside government officials where possible. Whilst doing this we collect evidence of the impact of our work. We can then engage with government and other authorities, locally and at the national level, to present a case for increased investment in the areas where we work, based on the evidence we are generating. This is advocacy!